Updated: 3:10 p.m. | Posted: 10:08 a.m.
A coalition of left-leaning states and environmental groups are vowing to fight the Trump administration's move to kill an Obama-era effort to limit carbon emissions from coal-fired power plants. 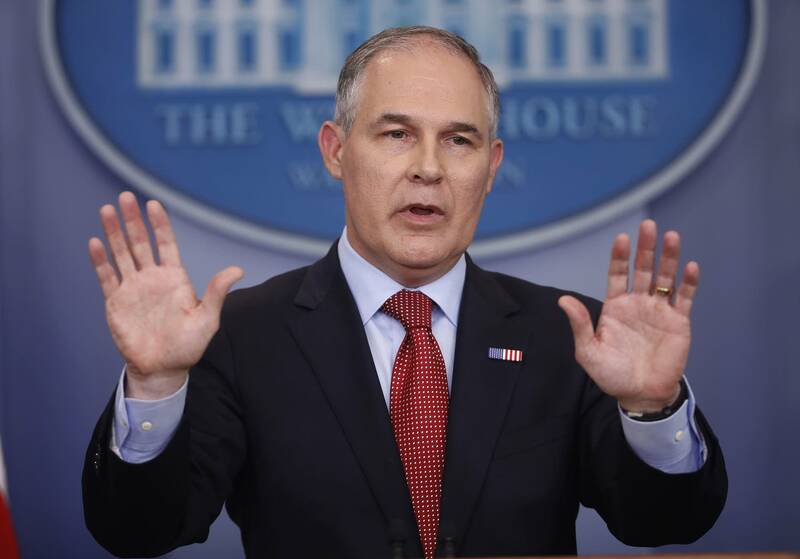 Speaking Monday in the coal-mining state of Kentucky, Environmental Protection Agency Administrator Scott Pruitt said he would be issuing a new set of rules overriding the Clean Power Plan, the centerpiece of President Barack Obama's drive to curb global climate change. "The war on coal is over," Pruitt declared, adding that no federal agency should ever use its authority to "declare war on any sector of our economy." It was not immediately clear if Pruitt would seek to issue a new rule without congressional approval, which Republicans had criticized the Obama administration for doing. Pruitt's rule wouldn't become final for months, and is then highly likely to face a raft of legal challenges. New York Attorney General Eric Schneiderman was among those who said they will sue. "The Trump Administration's persistent and indefensible denial of climate change — and their continued assault on actions essential to stemming its increasing devastation — is reprehensible, and I will use every available legal tool to fight their dangerous agenda," said Schneiderman, a Democrat. For Pruitt, getting rid of the Clean Power Plan will mark the culmination of a long fight he began as the elected attorney general of Oklahoma. Pruitt was among about two dozen attorney generals who sued to stop Obama's 2014 push to limit carbon emissions, stymieing the limits from ever taking effect. Closely aligned with the oil and gas industry in his home state, Pruitt rejects the consensus of scientists that man-made emissions from burning fossil fuels are the primary driver of global climate change. Pruitt appeared at an event with Senate Majority Leader Mitch McConnell at Whayne Supply in Hazard, Kentucky, a company that sells coal mining supplies. The store's owners have been forced to lay off about 60 percent of its workers in recent years. On Thursday, Trump nominated former coal-industry lobbyist Andrew Wheeler to serve as Pruitt's top deputy at EPA -- one of several recent political appointees at the agency with direct ties to the fossil fuel interests. Despite the rhetoric about saving coal, government statistics show that coal mines currently employ only about 52,000 workers nationally — a modest 4-percent uptick since Trump became president. Those numbers are dwarfed by the jobs created by building such clean power infrastructure as wind turbines and solar arrays.